No need to install another tool. Invite marbot to your Slack channel, and he will escalate alarms among all team members. Talk to marbot like you talk to with your team members: in plain English. Alternatively, you can use Slack-native user interfaces. Each week, marbot rewards the most team members who made sure your applications are always running. The detailed statistics help you to optimize your alert configuration as well. 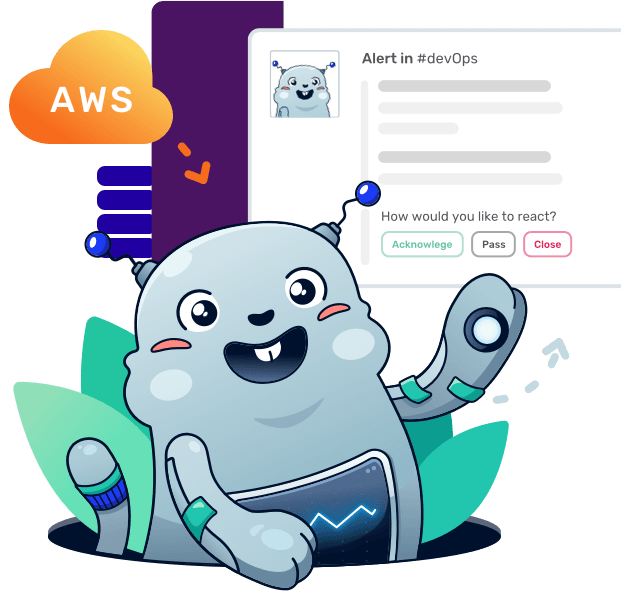 Haven't set up alarms for your AWS infrastructure yet? No problem, marbot helps you to set up monitoring for all parts of your infrastructure with ready-to-use templates. Want to send different types of alerts to different team members? No problem, use different Slack channels and invite marbot to each of these channels. Your team receives alerts as direct messages or channel messages via Slack. The alert includes relevant details to understand and solve the problem. Only get alerted when necessary. To avoid a flood of alerts, marbot groups similar events. Also, marbot starts sending an alert to a single team member. Each alert can either be acknowledged, passed on or closed. Unnoticed alerts are escalated to another team member or the whole crew if needed. marbot adds Quick Links pointing to the AWS Management Console automatically. marbot attaches runbooks to provide structured procedures to respond to incidents as well. Strong integrations with AWS and 3rd party services. More than 1,500 users solve 5,000+ incidents every week. Add me to Slack and start your 14-day free trial. No credit card required. Andreas and Michael Wittig built marbot during the Serverless Chatbot Competition 2016 and won the hackathon. Since then they have added new features and improved me step by step. Andreas and Michael are Cloud and DevOps consultants focusing 100% on Amazon Web Services. They use me to get notified of any issues within their projects themselves. You should check out their blog as well.